The classes are to be held on Saturday, May 12th and Sunday, May 13th in Room 3-D at the University of London Union, which is on Malet Street in the Bloomsbury section of London. (See map.) 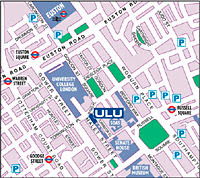 As the map shows, the location is an easy walk from the Russell Square tube station. The Sunday seminar will be a repeat of Saturday's session, to accommodate those photographers who are likely to be booked on Saturdays in May. Registration is on a first-come, first-served basis. If you would like to have your choice of days, I would suggest booking early. The last seminar sold out in six days. If, for some reason, a cancellation is required after booking, refunds will be granted up until April 20th. After that time, you would be responsible for transferring your seat to another attendee. Please note: If, through events beyond my control, I am unable to travel to London, refunds will be limited to the ticket price. As I already have airfare and venue rental paid in advance, I do not anticipate this happening. But I just wanted to cover all of the bases, in case I get run over by a bus tomorrow. Bases covered, I have to say that I am very much looking forward to this trip and especially to meeting many of the site's UK readers. As I do more of these seminars, I find that each session develops a vibe of its own. You put a few dozen photographers who are all eager to learn in a room, and what starts out as a simple stack of talking points turns into a rich, organic discussion that ends with everyone - including me - having a head swimming with new ideas. My goal is threefold: To refine your approach to creating light, to fill you with as many ideas as possible in a day's time and to have fun doing it. We'll start with a roadmap for the day, which I will do my best to keep us on. But each session will take on somewhat of a life of its own. Which is a good thing. Attendees should already be familiar with the basic concepts of Lighting 101 to allow for more efficient use of our classroom time. Initially, we'll be steering away from specific techniques in favor of gaining better insight into the factors and variables that are at play when designing light. We'll introduce different light sources and modifiers within the context the discussion. With light, every variable is a give-and-take situation. Every technique yields specific pluses and minuses. We'll concentrate on how to allocate your light - and technique - to best advantage. The goal will be to help you develop a much more intuitive understanding of light. Every room, setting or environment comes with its own unique set of opportunities not only for adding light, but for controlling the relationship between the added and the pre-existing light. We will use our classroom as a example to teach the process of brainstorming (or "roomstorming," if you will) a wide range of potential lighting solutions for any environment. This process will reinforce the principles discussed earlier in the morning. Throughout the day, we'll be continually studying the room, exploring ideas for both lighting and photo design. 3. Having discussed both general lighting theory and the specific environmental opportunities and challenges of our classroom, we'll design and shoot a variety of photos using inexpensive, highly portable lighting gear. We'll be basing the solutions on specific, theoretical assignments generated by group discussion. As we shoot, we will view and discuss the photos as they appear on a TV screen. This instant feedback in a group environment is an amazingly efficient way to drive home the thought and technique process. We can read and write all we want, but for photographers there is nothing better than "monkey see, money do." The goal will be to incorporate lighting theory, room environment, assignment constraints and our available gear to create a photo that seeks to produce an photograph that is an appropriate response to our situation. Working within that framework will allow us to concentrate on better freeing ourselves in the other areas: Creativity and subject/photographer interaction. The entire day will be a continuous flow of ideas and techniques, punctuated by spur-of-the-moment Q-and-A. I want you to bring lots of questions, and to feel free to voice the ones that pop into your head throughout the day. Other than that, you might want to bring a notebook and pencils. And dress very casually, so you won't feel out of place when I show up in shorts. If I wear anything at all. As with my philosophy for the website there will be no secrets and no posturing. This stuff is not rocket science. It's light. The first step in learning to light is to realize that anyone can get very good at it. To register for either seminar (with any major credit card) please click on the appropriate link at the bottom of the post, which will take you to PayPal. A PayPal account is not required to register. You will be returned to this site after successfully registering. Please leave your name and phone number (and a working email if different from the PayPal address) in the info box on the PayPal page, in case I should need to contact you. And please make sure to click on the correct day. Please post any questions in the comments section. I look forward to seeing you there. UPDATE: Please note that the sign-up links have been removed, as Saturday sold out (within a few hours.) Sunday's remaining few seats are now on allocation by waiting list. See this update post for details.